and this cover is perfect." Proven covers that protect your camera from rain, snow, or dust so you can capture more great photos! Velcro opening for tripod or handheld usage. Used by thousands of satisfied customers worldwide. Fits a DSLR with a wide angle, normal, or "travel zoom" lens. Can also be used to protect a small video camera. Canon 70-200 f/2.8 APO & 100-400mm IS lens. Nikon 70-200 f/2.8 APO & 80-400mm VR lens. Works with shorter lenses too. Protection for a DSLR with a 300mm or 400mm f/4 lens & hood. Can be used with large video cameras. Nikon 200-400mm VR lens & hood. Canon or Nikon 400mm f/2.8 lens & hood. Canon or Nikon 500mm f/4.0 lens & hood. Effective protection for 600mm & 800mm lens & hood. 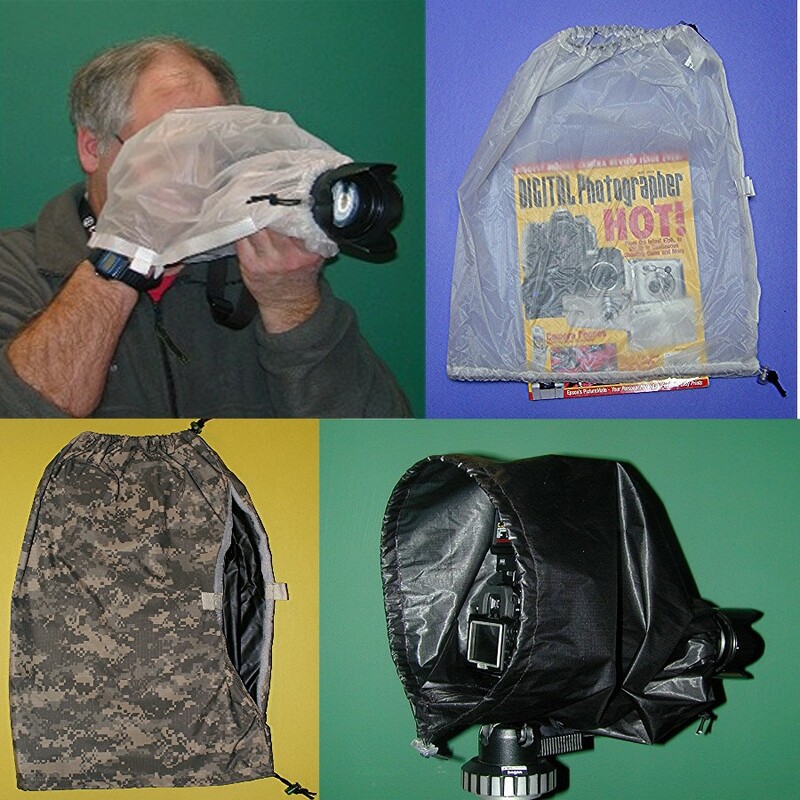 "My FotoSharp camera raincoats have protected my professional gear for many years, from snow, rain, soot, mud, and sand. They are still in great shape and continue to do exactly as they were designed to do. I recommend Fotosharp to everyone." "Recently on a shoot where it rained all day, the cover absolutely kept my gear dry. It wasn't a lite drizzle either, but a constant downpour." "I’ve used these covers in rain and in wet snow and they do a good job ... really tough and waterproof." "I just spent five weeks shooting in Africa, often in the monsoon deluge. Thank goodness for my clear FotoSharp pro cover that I always carry in my bag for shooting in the rain." "Great Product. Recommended it to hundreds of students." "Simple, super light weight, does the job! Good velcro opening length to allow for different heads, camera configs."